You are here: Home › News › A week of superstars and pianos! What a week (and I don’t just mean the politics). It began with delivering a Feurich grand piano to Emeli Sande, included the Royal Birmingham Ballet rehearsing at Henry Wood Hall and ended viewing a beautiful Gaveau grand piano in Kent for Robbie Williams at David Winston’s Period Pianos. 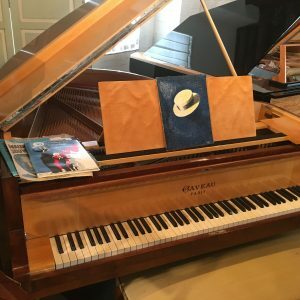 I was charmed to find Maurice Chevalier’s piano there, another lovely Gaveau grand, which had been in his flat since his death in 1972. What syle!